After being hit by a car, she suddenly found herself in the afterlife… or so she thought, but for some reason she was reincarnated as a baby in another world?! Lizbeth was raised by incredibly doting and beautiful parents, and using the knowledge from her former life she makes a goal to “have a moderately successful life” in this world. However, her talent for magic is abnormal, and a prince, along with many other noble young men have either become infatuated with her, aim to kill her, or almost die… that isn’t “moderate” at all! But even so, she swears to obtain the happy life she envisioned, somehow! It's alright, I guess. It started off strong but after awhile it seemed to just be about the hunky underaged boys. Which is fine, the MC is a little girl too, but then it gets kind of creepy when the one that seems to be the main hunky boy is eight years older than her and fell in love with her when she was four. Ew ew ew. Eighteen year old man creeping on a ten year old girl is Not Cool. MC got reincarnated as a baby in medieval Europe story with magic. With her cheat ability to summon rain and storm, she tend her garden everyday. A cute reverse harem reincarnation story. But honestly, these scenarios are a dime a dozen and this series doesn't really bring anything new to the table, aside from the world's least convincing child; nor does it surpass other series in terms of quality or entertainment. Where usual rebirth stories take the stance of a child with memories of their past life, the MC is very much a 20 something year old in the body of a child, and all her actions and speech fall in line with this. Unfortunately, all... more>> the male leads are... really very young, and it's a little weird since she's still an adult in my mind. Initially I enjoyed the story, probably from chapter 3~18. That aside, let's get to the actual review. The grammar is about standard most of the time, showing instances of awkward wording/phrasing, and misspelling. The story is nothing new, and quite frankly it causes the later chapters to become extremely predictable and boring. The writing, while it has its moments, becomes rather dull and lacks any real meaning aside from making the MC look better. Initially, the MC is portrayed as a strong-willed older woman in the... more>> body of a child, which then degrades in later chapters to confused tween wondering which boy-toy is actually in to her. I understand that this is following the usual shojo-like development where everyone loves the MC, but like so many other Harem and Reverse-Harem stories, the loves only develops naturally with one character while the rest are extremely questionable. The translation itself is pretty good with a bit of syntax and sentence structure errors but nothing so major to hinder the reading experience. The edited chapters do have better delivery and I believe, with time, the quality will improve. Kudos and thanks to Ainushi Translations for the effort! Cute little story with a somewhat OP female MC that is intelligent, but can be rather dense in your typical MC sort of way when it comes to affection from the opposite gender. She's very much aware of affection from other people, but has a tendency to explain things away or even actively try to avoid it because it's too troublesome. The MC is definitely powerful and is clearly more powerful than most people she comes across, but not so much that she can completely stomp everyone she comes across... more>> all the time (though most people she encounters will be clearly weaker than her). It's a complete story with 160 chapters following the main character's adventures from birth to age ~16, along with 11 after story chapters. I've only read up to c37 of the original raw and it's rather cute so far with a few moments of action interspersed between the MC's encounters with her various potential romantic partners. This series is one cute and fluffy reverse harem with a decent MC. The translation is good. Though I quite like it, I cannot fully enjoy the story. The MC is blessed like a 'cheat', she has her previous life's memories so that she can be considered a mature and calm, but the way she get evaluated to be a 'genius' and get everybody else surprised every move she makes is really annoying. The dialogue is very well written, but nothing particularly interesting or original ever happens. For slice of life or romance fans that could still work out, but even then I feel there are ones with more flavor than this. Quite a lovely story, the main character is a really nice girl with an extremely cute personality, one of the favorite novels I'm reading right now, I'd definitely recommend it for anyone that likes the other world reincarnation genre. Its a very fuwa fuwa tale, the character is likeable and cute. I like how adorable she is and how she interacts with those love interests and how mature she is than her peers. Its just a regret that longer the story continues, the more spoilt and childish she became. I become attractive at her in the first place because how mature she acts ('cos she died in her first life at almost reach her 30s) but as it continues, her mature mind regressed and became like really a child (a genius child, what I mean), but overall, the... more>> storyline is quite interesting. 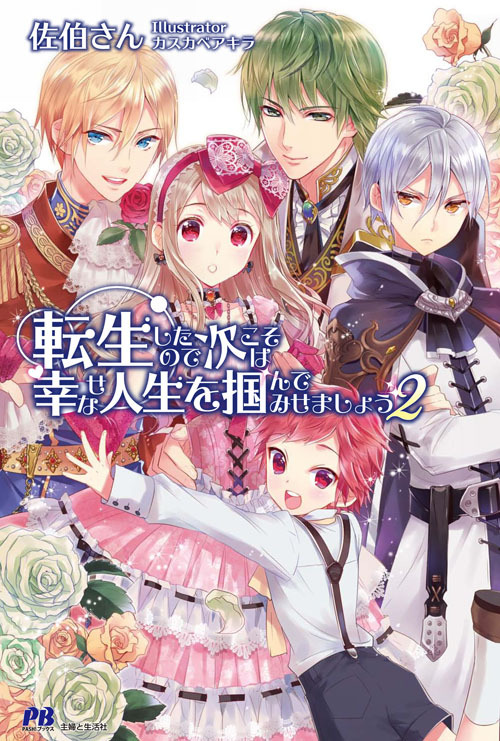 Typical reincarnation story, similar to otome reincarnation stories I guess. Cute story maybe, though the MC isn't that innocent or cute, probably because of her adult mind and way of thinking/acting. There's a couple of problems with the MC. She's aware of things like the prince falling for her and about the troublesome issues of raising flags, yet she's still pretty dense to everyone else. It seems like another reincarnation story, but that isn't a bad thing. The storyline is quite interesting. The MC leaves us wanting to know what will happen next with her and the prince, will she fall in love with him or her magic tutor, will she simply be a good friend that gives occasionally good hugs? I can't wait to find out more. Although I fairly enjoyed the story, it's nothing too different. It's VERY light-hearted at times but then throws some serious scenes at you. She's clever in the sense that she uses her child appearance to her advantage and her cute charms to get what she wants, but as every shoujo protagonist is, she is in utter denial of any romance headed her way. She's likable, but can be frustrating at times. She acts childish (as a mentally 30-year-old woman) and at times is way too dense to have lived another life. She can discern a person's character easily yet she can't tell when someone is blatantly in love with her. My favorite character is Gilleraide Sévéne, or Gilles (the green haired character on the cover). Probably due to my bias towards the older, caring senpai-type. His character development is a little underwhelming. I wish it was focused on a little more, but I enjoyed seeing him overcome his trauma and confront his household (his father especially). He's always teasing the protagonist and comforting her in her time of need. PERSONALLY, I SUPPORT GILLES IN WHATEVER HE WISHES TO DO. The best thing about this book is that her family is super caring! Her little brother is super adorable and melts my heart. Her parents act like young lovers and care for their children greatly. After reading so many books with terrible families, this was really enjoyable and I found myself cheering the protagonist on even though she wasn't always my favorite. It wasn't anything too shocking or immersing. It was just casual. There weren't even that many interactions with the guys. Of course, the protagonists voices her wish to not raise flags with the men but goes on to be intimate and hug them etc. In short, she friend-zones everyone and doesn't know what to do with herself, reasonable for a shoujo novel, but keep in mind, she's mentally 30-years-old. It's tagged reverse-harem, but there's really only two guys that really show an interest, and she's friend-zoned them. The storyline isn't anything impressive. There's nothing pulling the carriage, just small rocks along the way. In other words, there isn't a main issue/problem. It's mainly a slice of life with no lead. The summary made it seem somewhat exciting, but let me tell you this before you read it. The "aim to kill her, or almost die... " part in the summary is VERY VERY misleading. Most of her 'near death' experiences are not due to these young noblemen. This is a fun story to read.. I like the love interests although my like for Gilles plummeted because he treats Cecil kinda harsh when it is not his fault. Lol. The MC likes affection although she is kinda gullible and confusing. She does not like the straight-forward affection displayed by the crown prince but likes (and cling) to her tutor/servant's sneaky tactics? Kinda ironic. So far I like Cecil the most. He is a precious child. Cute! I'm thoroughly caught by her cute younger brother as the story progresses. The Female Lead's character was portrayed perfectly with her supposed-to-be child mindset even though she has her past life's memory. Looking forward to how the story will continue.